Another 100 miler, taking our total to 622 miles. In terms of funds raised, we are now over £508,000. Thank you to everyone for your great support. For the second successive day, I managed to post a blog before breakfast, and was able to leave with the others. First out were Doug, Karen, Marion and Kerry; then Steve, Kate, Peter and John; followed by Andy, Sara and me; then Nick, Tim, Susan and Stefano. Conditions were overcast and cool, with a threat of rain, which duly appeared after about 10 miles. It was heavy, and before long we were soaked through. There was no point in calling in the van and changing: if it persisted, a change would not last long; if it cleared, we would dry out. It cleared. By the time we got beyond Kings Lynn we were drying nicely, and there was finally a bit of warmth in the air. 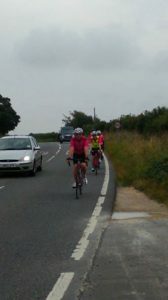 We targeted Terrington St Clement for our first food stop, but there was nothing there. So we pressed on through Sutton Bridge to Long Sutton, where we were very well fed. At 43 miles that was good riding, so we were ready for it. In Long Sutton, a shop owner called Sheila Tiller took the collecting tub from Gary, and proceeded to go around every single shop in the town requesting donations. Thank you Sheila. 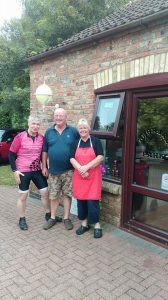 At Long Sutton Team Andy made a call to head to Coningsby, another 30 miles on, then pick up the Water Rail Way, Sustrans Route 1 into Lincoln. It was an excellent call on two counts. First we put good mileage behind us, in a featureless landscape with a constant reek of rotting cabbage; second it transformed the final 20 miles. Coningsby is dominated by the RAF base and both Tornados and Typhoons were roaring in and out as we approached. We ate at Penny’s Place Cottage Café, good food and hospitality, but gigantic portions, which were impossible to finish. I have done many 100 mile days with Life Cycles (between 10 and 20). The final 20 miles is always a real killer as your destination approaches ever more slowly. Not so today, because of the wonderful landscape of the Water Rail Way. It is an excellent surface along the old Lincoln to Boston railway line, running between the River Witham and a canal. As well as the lovely flora, fauna and bird life, the route is also a sculpture trail, and it was empty. We covered that distance at a consistent 15 – 16 mph. We arrived at the Premier Inn just before 1800, and just as the other groups were arriving. This evening more guests arrived. 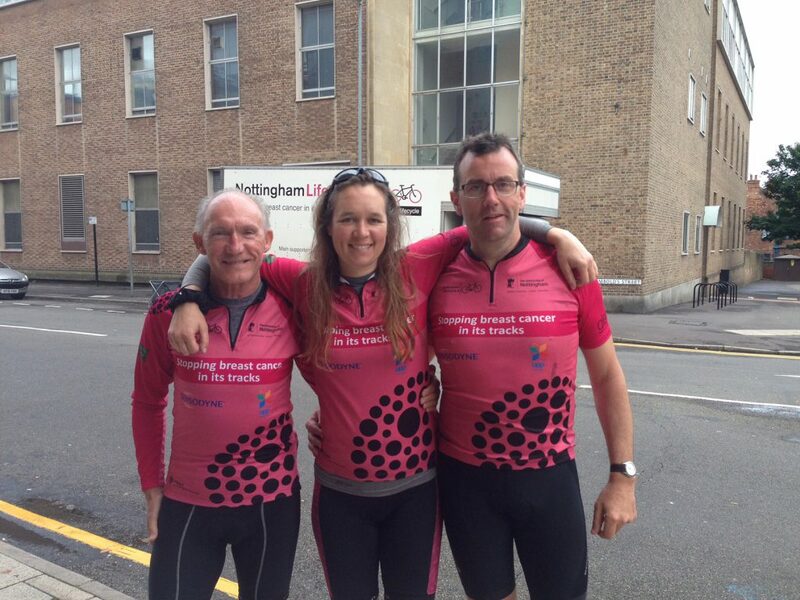 Andrew Leyshon from the School of Geography will ride with us tomorrow, as will Fraser (Kerry’s partner) and Peter Gadsby will ride for a second day. Julie Miles (who saw us off at Lizard Point) and Alan Walker joined us, and Susan and Jenni are still here. It is great to have you all involved. 600 miles plus on the road is taking its toll on the riders and with six of the seven days thus far being 90 – 100 miles, it has been a heck of a physical challenge. Pressure on time (and I suspect mental fatigue) has resulted in items being misplaced, lost, even lost and found. Stefano lost his credit cards, cancelled them, then discovered they were in a trouser pocket in his case. Steve left a set of glasses by a roadside, and others have left cables behind in hotels. As ever our Support Team, now led by Gavin, have been key to progress: keeping our bikes roadworthy, making running repairs, changing cleats, and just ensuring the van is available for fluids and any food top ups. The Megomnium is back in competition. First there was a review of footage of a dressage competition at Newmarket a couple of days ago. This involved Susan, Steve, Sara and Kate. It was a bit of a shambles, with most of the competitors looking as though they had been electrocuted. Steve gave the event some semblance of dignity with the balletic motions which we associate with his hand signals. So, that’s 10 points to Steve, and since he was smart enough to play a joker, it doubles to 20. A big move up the leader board for him. Today’s discipline was the Water Rail Way Steeple Chase. This had an element of orienteering to it, in that you had to find the track, complete the 21 miles and negotiate any off road sections. Team Andy did all that. So 10 points each for Andy, Sara and David. Since Andy played his joker, he and Sara double to 20. Those in the teens have work to do, but even factoring in any further suspensions, they have plenty of time. Two other things: the judges are figuring out how to incorporate Kerry, with an appropriate number of points applied; and I think they are planning a sting on Dr John. Today’s Life Cycle miles were ridden for Frances Dean (nominated by Julia Bell) who despite secondary cancer is a tireless volunteer for Breast Cancer Care; Sue Stannard (nominated by Emma Oldham) who is one of the voices behind the LC6 campaign; and Edward Grant (nominated by Cheri Ambrose) to remind us that, although small in numbers, this disease does affect men too. 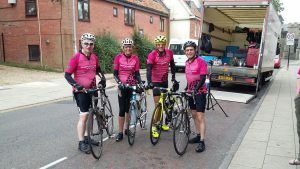 Tomorrow we head due north for Thirsk, the third 100 mile day in a row. I’m sorry, you are all brilliant, but I think you need to consider yourselves outclassed by the description of the dressage competition today! For related reasons, I can see why the Lincolnshire tourist board (landscape division) might be in touch. Glad to see the total raised moving up in honour of your wonderful efforts for this great cause. Very excited to recognise some rules in the Megomnium and kudos to those who are managing to maintain a near-static score; not easy when points are on offer in such varied ways. Congratulations to the team on another great day! It has been a pleasure following you for the past 3 days. The support team are amazing and everyone always makes me and the kids feel so welcome. I’m so proud of you all and how you are all coping with the long days. Cycle safely north and see you when you finish. I hope that other people have noticed how long Sara’s arm looks in the photo with Michael and Steve? She’s part spider and cunningly rotates using each of her legs each day – hence never looking tired. Wow nearly half way there, you are all doing an amazingly! 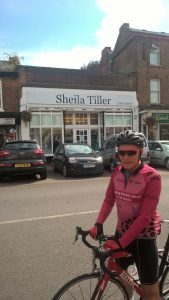 How lovely it must be to meet people like Sheila who give you an unexpected boost to moral and your fundraising target. You really are all real life super heroes to keep going whatever the day and weather throws at you! I am really enjoying following your adventures on the blog. Good luck for today, I shall look forward to reading all about it. Well done to all of you another superb effort. Another great blog Dad, maybe you should contact Donald Trump to see if you can borrow the phrase “I know words, I have the best words”, or just follow Trump campaign policy and plagarise him!